Classical Net Review - Hanson - Symphonies #1-3, Piano Concerto, etc. Howard Hanson is one of those composers who refused to be affected by the sea changes that swept classical music in the 20th century. This priceless set, which also includes a hugely important disc with the composer explaining his own works, is truly a must for lovers of late romantic music. The three symphonies all have characteristics of their own but it is the Second to which I most warmed to with its soaring melodies and its wonderfully epic Finale that truly breaks all conventions in its sheer beauty. The final Allegro con brio is truly one of best pieces Hanson ever wrote. Mouledos is a sympathetic interpreter of the Piano Concerto that moves along at a merry pace whilst both the 'Merry Mount' Suite and 'Mosaics' are permeated with the same sort of rugged beauty that one imagines in upstate New York where Hanson was based for most of his working life. I also enjoyed the short but expressive "Elegy" composed in memory of that great conductor Serge Koussevitzky and the equally expressive 'Lament for Beowulf' with its substantial choral contribution. 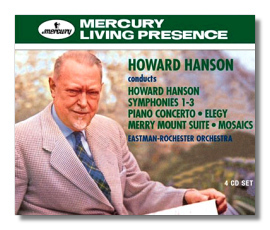 However the real essential part of this set is the disc titled 'The Composer Speaks' where one can gain a fascinating and unique insight into Hanson's works. Truly a delightful set, pristinely recorded and beautifully presented which makes itself self-recommending on all counts.